With secure land tenure, Indigenous Peoples and local communities can realize human rights, achieve economic growth, protect the environment, and maintain cultural integrity. The gap between formally recognized and customarily held and managed land is a significant source of underdevelopment, conflict, and environmental degradation . Strong rights to land are vital for Indigenous Peoples and local communities. When community land rights are weak, such areas are vulnerable to land grabbing, expropriation without compensation, and encroachment by outsiders . Without secure tenure rights , meaning rights that are enforceable and recognized by governments and others, communities face increased risk of poverty, poor health, and human rights abuse. Securing community tenure rights is not only crucial from a human rights and socio-economic development perspective, it is also necessary to mitigate climate change, foster sustainable development, and promote peacebuilding across the globe . There are at least four major international instruments that call for the respect and protection of indigenous and community land rights: International Labour Organization (ILO) Convention 169 (Indigenous and Tribal Peoples Convention) (1989) , the Convention on Biological Diversity (1992), the United Nations Declaration on the Rights of Indigenous Peoples (UNDRIP) (2007) , and the Voluntary Guidelines on the Responsible Governance of Tenure of Land, Fisheries, and Forests in the Context of National Food Security (the VGGTs) (2012) . Additionally, the World Bank Environmental and Social Standard 7, International Finance Corporation (IFC) Performance Standard 7, and other policies enacted by multilateral institutions require borrowers of funding for development projects to respect the tenure rights of Indigenous Peoples. The International Labour Organization (ILO) is an agency of the United Nations dedicated to improving working conditions and promoting human rights for people around the world . ILO enacted Convention 169 on Indigenous and Tribal Peoples in 1989. ILO Convention 169 is a legally binding treaty which calls for state recognition and protection of the land ownership rights of indigenous and tribal people . Additionally, Article 16 of ILO Convention 169 states that “where the relocation of [indigenous and tribal people] is considered necessary as an exceptional measure, such relocation shall take place only with their free and informed consent.” Indigenous rights to Free Prior and Informed Consent (FPIC) have since been established in UNDRIP, the VGGTs, and the land policies of several major companies . However, few countries have incorporated FPIC into their national laws (see section below on community protection at the national level) . While ILO Convention 169 is binding on State actors that ratify the Convention, only 22 countries have ratified it so far (most of these 22 countries are in Latin America) . The Convention on Biological Diversity aims at promoting the sustainable development of the earth’s plants, animals, and people . This Convention was signed by 150 governments at the Rio Earth Summit in 1992. Article 10 of the Convention states that each Contracting Party shall, as far as possible, “protect and encourage customary use of biological resources in accordance with traditional cultural practices that are compatible with conservation or sustainable use requirements.” The Convention is legally binding, and there are currently 193 parties to the Convention . UNDRIP was finally adopted in 2007 after the United Nations Working Group on Indigenous Populations negotiated and developed its contents for over 25 years. UNDRIP emphasizes the right “to lands, territories, and resources which they have traditionally owned, occupied or otherwise used or acquired...constitute(s) the minimum standards for the survival, dignity and well-being of the indigenous peoples of the world” . While UNDRIP is not a legally binding instrument under international law, 143 countries voted in favour of its adoption. At the same time, Australia, Canada, New Zealand, and the United States voted against the adoption of UNDRIP. Section 9 of the VGGTs establishes principles on Indigenous Peoples and other communities with customary tenure systems. Section 9.4 establishes that “States should provide appropriate recognition and protection of the legitimate tenure rights of indigenous people and other communities with customary tenure systems, consistent with existing obligations under national and international law.” Section 9.3 of the VGGTs also calls for states to meet their obligations established under national laws as well as ILO Convention 169, the Convention on Biological Diversity, and the UNDRIP. While the VGGTs are not legally binding on state actors, they are increasingly accepted by governments, companies, civil society organizations, and other stakeholders as the new international standard on land tenure. While national governments are increasingly recognizing the tenure rights of Indigenous Peoples and local communities, there remains ample room for improvement, as evidenced by the Rights and Resources Initiative's (RRI) finding that only 18% of the world’s land is legally recognized as owned or controlled by Indigenous Peoples and local communities . RRI's study measured community tenure rights in 64 countries, constituting 82 percent of global land area. It concluded that, of the countries assessed, 23% of land in Latin America, 16% of land in Sub-Saharan Africa, and 26% of land in Asia is either owned or controlled by Indigenous Peoples or local communities . On Land Book, RRI’s forest tenure data is available and shows the percentage of forest areas legally recognized as owned or controlled by Indigenous Peoples and local communities. LandMark, an online mapping platform, contains a set of indicators that measure the extent to which Indigenous and community lands are recognized and protected by law. LandMark’s data analyzes national legislative and regulatory legal frameworks for over 100 countries . The LandMark legal indicators show that countries in Africa and Latin America have the strongest laws protecting indigenous land rights while the Middle East lags behind. According to the World Resources Institute, “out of the countries with highest scores on the LandMark indicators (i.e. countries with the highest level of legal security), six are in Latin America (Bolivia, Colombia, Nicaragua, Panama, Peru, and Venezuela), four are in Africa (Burkina Faso, Tanzania, South Sudan, and Uganda), and one in Asia (Philippines)” . The LandMark indicators on the legal security of indigenous and community land will soon be available on Land Book. LandMark’s data indicates that few countries have incorporated the right to free, prior and informed consent (FPIC) into their national laws. Currently, Australia, Panama, Colombia, Philippines, Peru, South Africa, Taiwan, Venezuela have enacted national level laws that provide strong rights to FPIC or broad consent requirements. However, many other countries have not incorporated this internationally-recognized indigenous right into national laws. This is problematic given that up to half of the documented cases of major land deals since 2000 involved land claimed by Indigenous Peoples and local communities, according to forthcoming data from the Land Matrix Initiative . Research by Forest Peoples Programme shows that land deals are often made without properly recognizing and implementing community rights to FPIC . The Global Call to Action on Indigenous and Community Lands, also called the Land Rights Now campaign, was launched in 2016 with the aim of doubling the amount of land legally recognized as owned or controlled by Indigenous Peoples and local communities by 2020 . The Land Rights Now has campaigned for land tenure reform in Liberia, and more recently launched campaigns in Australia, Honduras, Mozambique, India, Peru, and Sri Lanka . Progress towards securing Indigenous and community tenure rights has been made in some countries. In Kenya, for instance, a new Community Land Act passed in 2016 which more clearly defines the process for achieving formal recognition, but still requires that most community land remains held by county governments until communities fulfill the requirements for securing collective titles . In Australia, courts recently awarded Indigenous Peoples $3 million in compensation for the extinguishment of their native titles . To help secure community tenure around the world, the Swedish government and other donors launched the International Land and Forest Tenure Facility in 2014 . This unique institution provides grants to advance land and forest tenure security and the rights and livelihoods of Indigenous Peoples and Local Communities. Despite these positive developments, there is still a long road ahead. In many countries, the process for achieving formal recognition is slow and burdensome for Indigenous Peoples and local communities. In Peru, for example, communities must clear 27 bureaucratic hurdles to achieve a formally recognized right, and the process could take over a year . Legal processes for achieving formally recognized rights can often be difficult to access, time-consuming, and expensive for communities. For instance, when the law requires communities to register their customary tenure rights, they often must decide on and demarcate clear boundaries around their land, obtain approval from land surveyors and other officials, and satisfy other cumbersome requirements . In effect, registration may erode the customary governance structures if, for example, the requirements entail establishing boundaries and establishing governing bodies that were not previously existent when land was managed under the communities’ customary tenure system. In India, the process for registering customary forest lands under the Forest Rights Act (2006) has experienced significant delays. According to RRI, as of 2015, it was estimated that only 3.4 million hectares were formally registered in India . However, approximately 40 million hectares of forest land, an area estimated to be populated by 150 million people (90 million tribal people), remain eligible for registration under the Forest Rights Act . New legal reforms for streamlining the recognition process are being considered by parliaments in Liberia, Myanmar, and other countries, but the passage of new land laws in these countries is still pending. A working group of Liberian civil society organizations has campaigned for the passage of the Land Rights Act, which would more clearly define customary lands held by communities, and has argued that failure to pass the Act could “plunge Liberia into violence and conflict” . Regarding land tenure reform in Myanmar, Roy Prosterman, founder of Landesa, has said that “a rare opportunity is knocking [in Myanmar], to directly benefit as many as four million of the poorest families on earth, and beyond that to support broader economic growth and the crucial processes of peaceful democratization in a country of 50 million” . The progress of community tenure reform is being stunted by the murders of land rights activists around the world, including Goldman Environmental Prize winner, Berta Caceres, from Honduras. According to Global Witness, 2015 was the deadliest year on record for activists--more than three land or environmental defenders were killed each week, and nearly half of these activists were from Indigenous communities . According to Felipe Milanez, former deputy editor of National Geographic Brazil, “Killing has become acceptable to achieve economic goals...I’ve never seen, working for the past 10 years in the Amazon, a situation so bad” . Research by the World Resources Institute and RRI shows that securing community tenure rights in forest areas can help mitigate climate change by reducing deforestation . The study entitled Securing Rights, Combating Climate Change presented several major findings, including that 1) when communities have no or weak legal rights, their forests tend to be vulnerable to deforestation and thus become a carbon dioxide emissions source and 2) legal forest rights and government protection of their rights can reduce carbon dioxide emissions and deforestation. 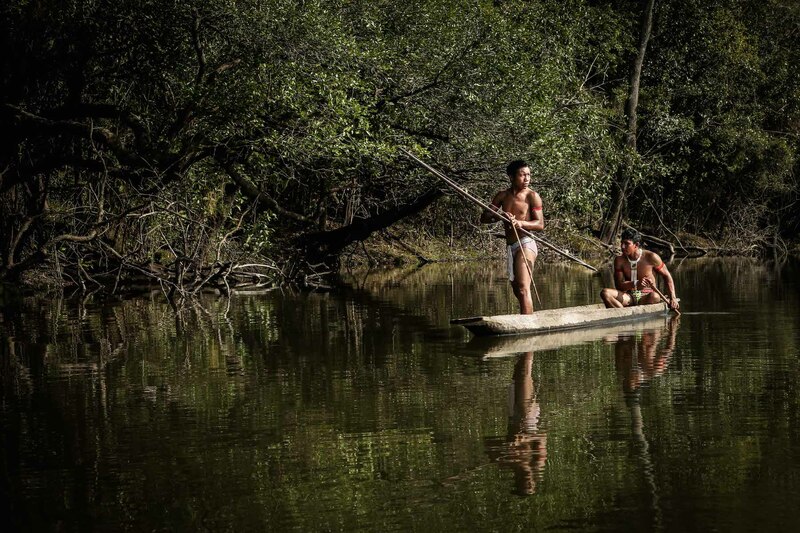 In Brazil, for example, only 0.6% of forest was lost inside Indigenous lands in the Brazilian Amazon between 2000 and 2012, compared with 7.0% outside such lands . Furthermore, a follow up report entitled Climate Costs, Tenure Benefits shows that the economic benefits, such as ecosystem services benefits, of securing community forest tenure far outweigh the costs associated with titling and monitoring community forest areas . New research by Woods Hole Center, World Resources Institue, and RRI shows that at least one tenth of total carbon found in tropical forests is located in collective forestlands lacking formal recognition . Unfortunately, the community tenure approach to combating climate change has not yet been adopted by many countries. While the 2015 Paris Agreement sets a goal of limiting global temperature rise to no more than 2 degrees Celsius, only 21 of the 188 countries that submitted climate action plans to implement the Paris Agreement made commitments to secure land rights as a climate mitigation strategy, according to RRI . Major carbon dioxide emitting countries, like Brazil and Indonesia, have not made such commitments . 1. Indigenous Peoples and local communities manage at least 24 percent of the total carbon stored aboveground in the world's tropical forests, or 54,546 million metric tons of carbon (MtC), a sum greater than 250 times the amount of carbon dioxide emitted by global air travel in 2015." 2. At least one-tenth of the total carbon found aboveground in the world’s tropical forests is located in collective forestlands lacking formal recognition, placing over 22,000 MtC at risk from external deforestation and/or degradation pressures. 3. Study results are a mere fraction of the forest carbon managed by Indigenous Peoples and local communities. Indigenous Peoples and local communities customarily claim at least 50 percent of the world’s lands, but legally own just 10 percent. The gap between recognized and unrecognized areas points to significant opportunities to scale-up the protection of customary rights. Articles 26 and 43, UNDRIP. RRI (Rights and Resources Initiative). 2015. “Who Owns the World’s Land? A Global Baseline of Formally Recognized Indigenous and Community Land Rights.” Washington, D.C.: RRI. Available at: http://www.rightsandresources.org/wp-content/uploads/GlobalBaseline_web.pdf. The average score for the ten indicators of the legal security of community lands is also provided. The average score for the ten indicators of the legal security of indigenous People lands is also provided. This indicator asks whether national laws adopt VGGT principle 16.1 by providing compensation for formally recognized tenure rights held by Indigenous Peoples and local communities. Section 16.